BAYONNE, New Jersey (AP) - A hunk of metal that crashed through the roof of a New Jersey home has NASA, Federal Aviation Administration and even U.S. defense officials curious. A man was watching television Tuesday when he heard a crash and saw a cloud of dust. In the next room, he found a hunk of gray metal, 3.5 inches (8.89 centimeters) by 5 inches (12.7 centimeters), with two hexagonal holes. Experts say the chunk is manmade, but no one can say where it came from. FAA officials said it would not have fallen from a plane headed into or out of nearby Newark Liberty International Airport. U.S. Air Force Major Costas Leonidou at the Pentagon said he could not identify the fallen object, either. "It could be Air Force, Navy, Marines, commercial. It could be anything,'' he said. BAYONNE, N.J. (AP) -- A hunk of metal that crashed through the roof of a home had NASA and Federal Aviation Administration officials scratching their heads. It didn't appear to be an airplane part either, the FAA said. Finally, FAA spokesman Jim Peters said Wednesday, a colleague in his office solved the mystery: It was part of a commercial woodchipper. The same part from another woodchipper's grinder had caused similar confusion last year, he said. How it got on a Bayonne roof was anyone guess, but Peters had a theory. The grinder piece moves very fast and, apparently, it can launch into the air if something goes wrong. The man who lives in the house was watching television Tuesday when he heard a crash and saw a cloud of dust. 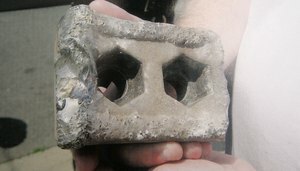 In the next room, he found the hunk of gray metal, 3 1/2 inches by 5 inches, with two hexagonal holes in it. The part was being returned to Bayonne Police on Wednesday, Peters said. "It belongs to somebody,'' Police Director Mark Smith said.